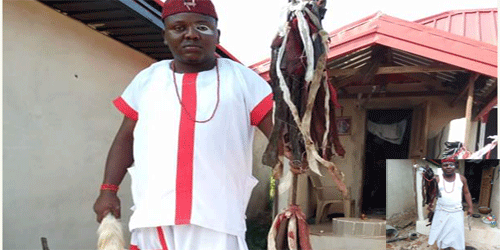 Just In Nigeria, As Nigerian Native Doctor, Chi Marine Temple Trend On The Internet Once again, after he releases a video of him making juju for a yahoo boy,.. This time around, he shared the video of him making a charm for a young ‘yahoo boy’ fraudster, as he justified the crime perpetrated by fraudsters. According to Chi Marine Temple in the video, Africans lost their wealth to westerners, and it is time for ‘yahoo’ boys to bring it back. 1 responses on "Native Doctor Doing Juju For Yahoo Boy, Video"